It is the end of my second week on Buckland Farm in Clearville, Pennsylvania. I have returned here to spend the rest of my summer in the countryside, reading peacefully while reclining in a hammock under the shade…. Reality check: This is a working farm and I am garden manager. With more than 200 tomato plants, peppers, lettuce, beats, potatoes, sweet potatoes, cabbage, radishes, kale, beans, Swiss chard, onions, carrots, garlic, and an herb garden to tend to, I keep pretty busy, as do the rest of the work crew and, of course, the owners. Planned tasks of planting, weeding, watering, mulching, and harvesting must be accomplished even in the midst of unplanned events, like high winds and thunder storms, Mexican Beetle infestations, and escaping turkeys. Of course, time must be set aside for socializing and relaxing. Enjoying farm meals, BBQs, card games and music. Taking some time alone for reading, writing, or calling friends back in the city. And time must be set aside for processing the summer harvest. Which is why for the next five posts, I will be sharing recipes for canning and other preserving techniques. 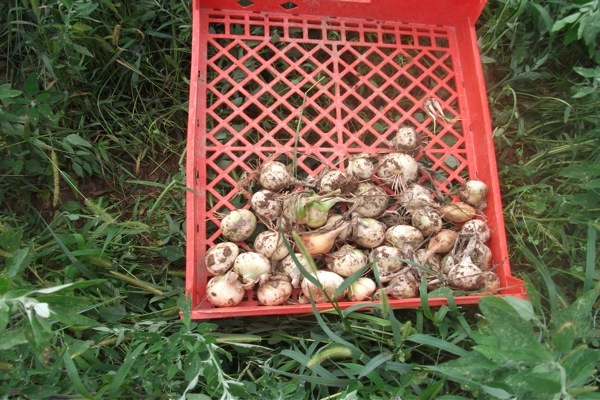 This week, we (finally) pulled all the onions. After selling some and giving away 40 pounds to a local food bank, we were still swimming in onions. While onions can be stored in the basement for months, they take up a lot of space. The answer: onion jam. Think of it as taking caramelized onions one step further. The result is a thick, sweet but savory jam -perfect for topping burgers or other grilled meats, or spreading on crunchy French bread for an appetizer. It is also the perfect base for a tomato sauce or as an alternative topping on pizza. The main ingredient being onions, it is also a surprisingly affordable jam. Cut the onions in half and slice them thinly crosswise; you should have about 10 heaping cups of onions. 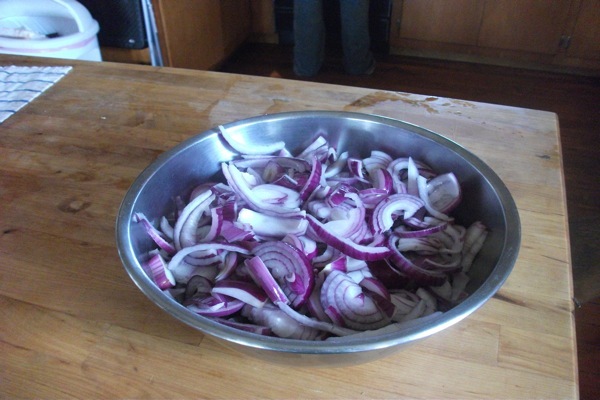 Mix the oil and onions together in a heavy 5 or 6-quart stock pot with a tight-fitting lid. Add the thyme and bay leaves, burying them in the onions. Season the onions with kosher salt and a few grinds of black pepper, and lower the heat to a simmer. Cover the pot and cook the onions for 20 minutes, stirring occasionally, until they have softened and released their liquid. Remove the lid and add the vinegars, water, honey, and sugar, stirring well. Maintain the heat at a steady simmer and continue to cook the onions for an additional 20 minutes, stirring the mixture often with a wooden spoon. When the liquid has reduced by about half, pick out and remove the bay leaves and continue cooking. 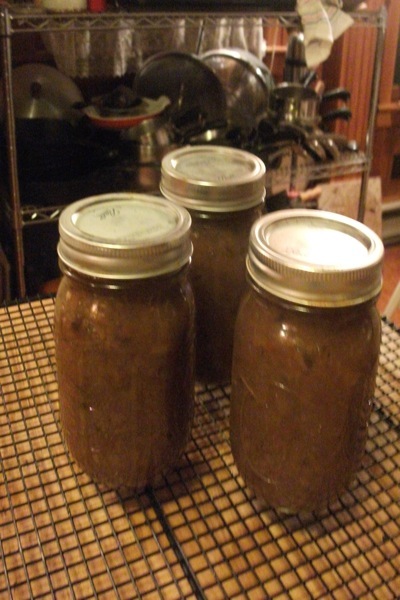 As the liquid continues to reduce, you must be careful to keep stirring to prevent the jam from scorching. Cooking the mixture until it is soft, sticky, and moves from the bottom of the pan as you stir, which can take up to 6 hours (I know, but so worth it! A good task to do while studying). Allow the mixture to cool slightly, then spoon it carefully into sterilized jars. Seal the jars and process in a water bath if you plan to store them, or keep the jam refrigerated for up to two months. How long in the water bath for processing?